Boyertown, Pa – August 10th, 2011 – Energy audits are a fast growing and vital portion of environmental and economic cost saving initiatives. 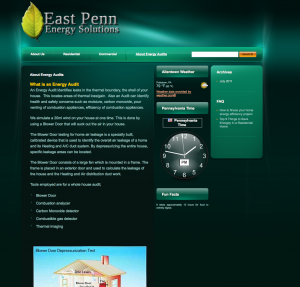 East Penn Energy Solutions serves homeowners and builders throughout the Delaware Valley. The site offers information and answers questions surrounding Energy Audits and what homeowners and builders need to know. “We are excited by the opportunity to spread information on how to save money on energy costs for our regions builders and home owners. Over the next months we will be adding even more material and information.” W. David Wallace President East Penn Energy Solutions LLC. East Penn Energy Solutions LLC is committed to energy conservation for the home owner. We perform home energy audits to identify ways to improve your comfort in your house while reducing your monthly utility costs. With our recommendations you can soon be on your way to cost savings and a comfortable house. We look at your house as a “Whole House System” and can identify heat loss and gain and can recommend upgrades for increased performance, efficiency and savings. Blazing Systems is a family-owned and operated company, a partnership, with over 60 years experience in the technology industry among the partners. Green technology tends to save more money in the long run, dpsiete being more expensive to begin with for example, motion-sensing light fixtures that only turn on when someone walks into a room are more expensive than regular lights, but after a few years the reduced power usage saves money. What examples of green energy are you looking at that are so cost-inefficient? Around here (Midwest) people have been installing windmills, which are quite green that have consistently proven profitable.